When you’re looking for a great maintenance utility, never fear that there is one somewhere. So many things, that I can hardly mention them all. What’s interesting is that many of these tools are already available, but IceClean just houses them under one roof. In any case, that makes it a lot easier to deal with when you need to get something done and you’re not hunting and pecking for the right tool to use. 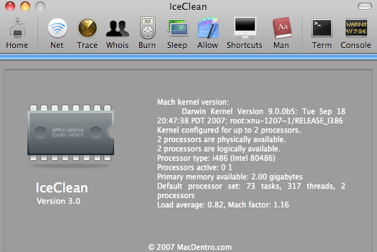 Freeware for MacOSX.